Everton left Stamford Bridge empty handed and although the late defeat left a bitter taste in the mouth, the recent upturn in grit and determination provides Evertonians with hope for the remainder of the season. Here we look at three talking points from last nights match. 1. The re-introduction of John Stones into the Everton defence has seen a significant improvement in the Blues resilience at the back, with Willian’s late winner only the second goal conceded in five Premier League matches since the young England centre back returned to the team. Stones oozes class and his tackle on Willian, just inside the box, early in the second half of the match was outstanding. 2. 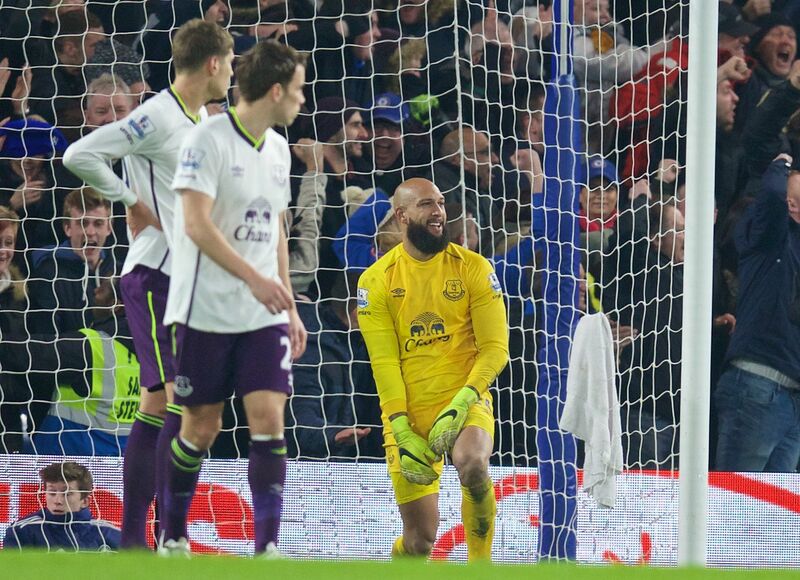 Tim Howard has been derided in recent weeks, particularly given the form of Joel. The American stopper had a strong performance between the posts for 89 minutes but should have done more to prevent Chelsea’s goal. Yes the drive from the Brazilian took a deflection on its way through, but Howard made little or no effort to get to the shot and a more agile keeper would have thrown a leg at the ball to deflect it wide for a corner kick. 3. Slightly more controversially and sure to divide opinion, but I thought Gareth Barry had a good game last night, particularly in the second half when he was reunited with James McCarthy in the Everton midfield. On a night when Everton struggled to keep the ball for long periods of play, Barry completed 51 or his 58 passes, more than any other player in white and purple. He also recovered the ball on 8 occasions, made 5 out of 6 tackles successfully and intercepted Chelsea attacks on 5 occasions. All team leading stats. Due to the late red card, Barry will be missing from the next match at home to Leicester (must win fixture) and Evertonians will get to see the partnership of McCarthy and Besic in action, but it is certainly to early to be writing off Gareth Barry. Previous Post Who should partner McCarthy in the Everton midfield?